So, the cleaning and purging continue. Today I’m working in the kitchen. Not much is leaving (yet), but I did re-arrange stuff so that I could get rid of that shelf I told you on December 24th was strictly temporary. I am through with the upper cabinets, and will get going on the bottom ones in a bit–I need to load the dishwasher first. I had to stop to show you the tea area. 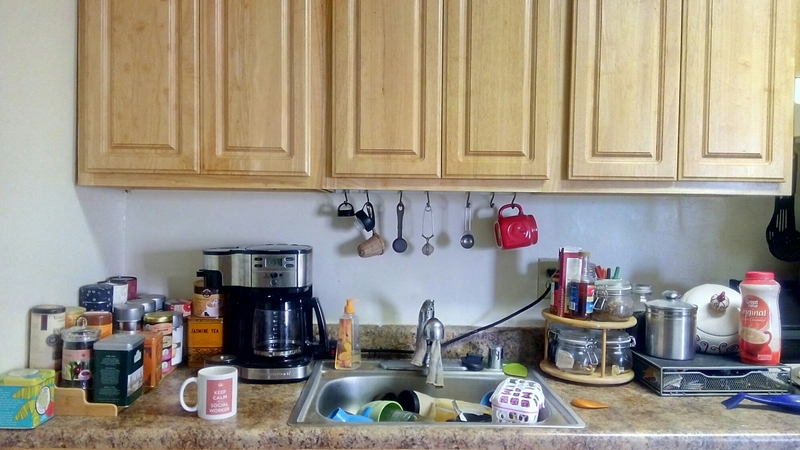 I know this doesn’t seem like nearly enough tea, but there is a wide drawer under the cabinet with the coffee pot, and it is full of bagged tea. Notice I did not name this post “Tea Problem.” The only possible tea problem I see is running out, and that is clearly NOT going to happen here. Not on my watch. This entry was posted on January 14, 2016, in cass cleans, cass laughs. Bookmark the permalink.